Chief executives sitting in lofty boardrooms make changes less frequently than the manufacturers of the cars they drive, or so it seems. One year ago we tested the BMW M5 and it was the only luxury muscle car with 400-plus kilowatts of power; the Mercedes-Benz E63 AMG made 386kW, the Jaguar XFR 375kW. Fast forward 12 months and the 404kW produced by the Jaguar XFR-S is the lowest of four cars tested here. 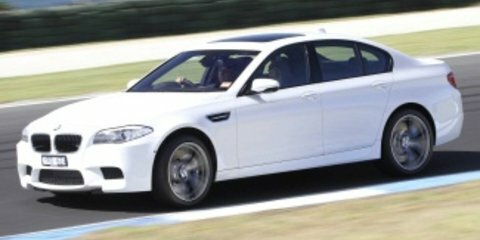 In fact the 412kW of 2012’s M5 would have placed it equal-third here, with the Audi RS6 Avant matching that figure. The facelifted M5 gets 423kW, the facelifted E63 ‘S’ AMG 430kW. There’s a perfectly good reason for tagging this bunch the ‘400 kilowatt club’, if only because the ‘between 680 Newton metre (Jag and BMW) and 800Nm (Benz) club’ doesn’t work as well. Pricing structures, too, have changed in just one year. The Jaguar XFR has since been repositioned at $189,900, a staggering $20,500 less than when it ran last in our November 2012 comparison. In its place has come the more powerful, aggressive, and hardened-up XFR-S for $222,545, although it remains the cheapest of the field. The E63 AMG, too, cost $258,885 in 386kW Performance Pack guise; the facelifted, single 430kW ‘S’ model now asks $249,900, which maintains its standing as the most expensive model here. Despite the Jaguar and Mercedes-Benz last time allowing the M5 onto the top spot of our comparison podium, both are now gruntier and better value. Increased competition means, fittingly, BMW has made the optional-overseas Competition Pack standard on the local M5. The BMW, now $229,900, has gone up $400 and it rises by only 11kW of power, although the manufacturer lists chassis improvements and equipment upgrades. Which leaves the newcomer to the posh muscle sedan … er, or wagon … club. The Audi RS6 Avant returns to the market not as a lead-tipped arrow thanks to the twin-turbo V10 hanging heavy well over the front wheels of the last-generation model, but as a newly platformed, lighter twin-turbo V8 version asking $225,000. There’s little between these cars and their clearly neurotic manufacturers for equipment for the money. Alloy wheels and tyres differ in size – 255mm front/285mm rear 19-inch Merc; 265mm/295mm 20-inch BMW and Jaguar; and monster 285mm 21-inch Audi – while brands on test include Dunlop Sport Maxx SP (RS6), Michelin Pilot Super Sport (M5), Continental ContiSportContact SP (E63) and Pirelli P Zero Nero (XFR-S). Both the BMW and Benz include safety technology systems such as LED high beam that automatically ‘blocks out’ the portion of beam affecting oncoming cars, which is one of the most brilliant features we’ve ever used; and auto collision-avoidance auto-braking only below 60km/h in the M5, while the E63 will avoid a collision below 54km/h and reduce the impact of one below 72km/h. Those features are not available on the Audi and Jaguar. Uniquely standard on the E63 S AMG, though, are active cruise control, auto parking assist and active lane keeping assistance that detects lane markings and can move the steering wheel to keep the car in the lane. Those three items are available as part of a $10,375 option pack on the Audi that also uniquely brings speed sign recognition and alert, and a night vision assistant that uses a strand of headlight beam to ‘flash’ a pedestrian. Meanwhile the BMW lane keeping assistance only buzzes the steering wheel if lane wander is detected, and can’t park itself at any price. The Jaguar can’t do either. The Audi RS6 Avant is better value than the Jaguar XFR-S, as it only costs $2455 extra but includes more equipment. Added are front parking sensors, 360-degree camera, head-up display, four-zone climate control (up from dual-zone), a sunroof, internet connectivity and auto-close boot-lid functionality – all of which are also standard on the others, although the Benz gets tri-zone climate. That’s not counting the benefits of wagon practicality, and 21s instead of 20s, either. Although electrically adjustable leather-trimmed front sports seats and steering wheel are common to all models, the RS6 is the only car here not to get ventilated cooling seats, though it matches the others’ seat heating. The E63 AMG goes a step further, uniquely incorporating a massage function and active side bolsters when cornering. The Audi has a larger screen than either the Jag or Benz, though – eight inches instead of seven, though the BMW trumps all with a 10.1-inch monster. The XFR-S counters with the best stereo here – a booming 825-watt 17-speaker Meridian unit eclipsing the RS6’s 600-watt 14-speaker Bose system, and the Harman Kardon units in the others (the E63 with 610 watts/14 speakers, the M5 with 600 watts/16 speakers). In the Audi, a Bang and Olufsen 1200-watt 15-speaker stereo can also be optioned for (gulp) $12,000. But the Jaguar needs to compensate for its dated satellite graphics and lack of internet, app connectivity, digital TV and radio tuner, all of which are standard in the others. The Audi even includes birds-eye Google 3D maps – super cool. Although the XFR-S has lovely, supportive front seats and beautiful Alcantara roof trim, its interior is otherwise not in the same league as the others. The problem is it doesn’t look all that different to the sub-$100K XF with which it shares its leather-topped dash, rising rotary transmission dial and acrobatic, revolving vents. The E63 S AMG suffers the same problem, though to a lesser degree. That’s because the Benz adds higher-grade furnshings like an IWC central clock and Alcantara-trimmed sports tiller, and a high-quality colour screen within the speedometer where the XFR-S has a dowdy tri-colour central display. The Benz also has more technology, Affalterbach-embossed seats, and a unique gearknob and switchgear. It feels special. The BMW feels more premium again, though, with its benchmark colour head-up display, massive screen, and stubby gearlever blending in with leather-topped surfacing. But the Audi is the most stunning here, with a level of tactility to its controls – note the knurled silver climate control knobs – and simplicity to its touchpad infotainment screen that’s unmatched. Yes, the RS6 is an Avant, but if the reaction out of the windows of a school bus travelling beside our Lunar Grey test car over the Sydney Harbour Bridge is any indication, the Audi doesn’t suffer for it. Check the pumped guards of the RS6 Avant versus the slim hips of the E63 AMG as an example of how wagons can be cooler. Then there’s the ‘quattro’ badge stamped on the lower grille that alone makes the $8500 carbonfibre kit on our test car worth the extra without considering the carbonfibre-capped mirrors and exhaust tip. Meanwhile the Audi is having none of the sloping-roofline ‘coupe-like’ sedan approach that afflicts the XFR-S (and the CLS63 AMG or M6 Gran Coupe) and restricts rear headroom. The Jaguar also has the least rear legroom of the bunch, while the other three are all about par – and very generous. The RS6 also has a benchmark 565-litre boot (540L Benz; 520L BMW; 500L Jag). On paper, the cheapest car here, the Jaguar XFR-S, also has the equal-least amount of torque, ‘only’ 680Nm lathered on between 2500rpm and 5500rpm, before being met by the 404kW of power at 6500rpm. Its 5.0-litre supercharged V8 engine is allied to the same eight-speed ZF automatic transmission as the Audi 4.0-litre twin-turbocharged V8 that makes 20Nm more (over a broader 1750-5500rpm). By comparison, the BMW 4.4-litre twin-turbocharged V8 outputs the same torque as the XFR-S (over a broader-again 1500-5750rpm) and uses a seven-speed ‘proper’ dual-clutch transmission, where the hefty 800Nm AMG lists a semi-dual-clutch automatic with the same number of ratios. The M5’s 423kW stays online between 6000-7000rpm, the RS6’s 412kW between 5700-6600rpm, but clearly the Audi is doing fine efficiency work, almost matching the BMW for power and eclipsing it for torque from a smaller engine. There may have been a twin-turbocharger replacement for 0.7 litres of displacement when the old 6.2-litre E63 turned into the new 5.5-litre E63 S, but it still has its rivals covered for cylinder size. Not coincidentally, then, it also beats them for power and torque. 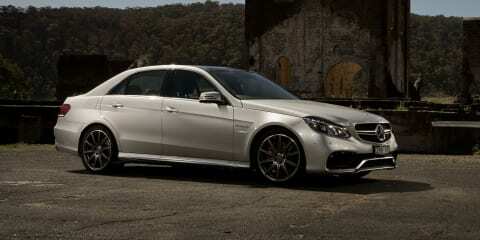 But while 430kW (at 5500rpm) and 800Nm (at 1750rpm) is the highest here, the E63 S AMG is not the quickest. That honour goes to the RS6, which gets launch control and all-wheel drive to provide a formidable traction advantage over its trio of rear-wheel-drive rivals. Alone with AWD it may be, but the Audi is also dominant with a claimed (and credible) 3.9-second 0-100km/h. Mercedes-Benz AMG can match that time with the 4MATIC version of the E63 S AMG, but because the front driveshaft props right (literally, to the right) out of the transmission where right-hand-drive steering hardware needs to go, AWD is only available in left-hand drive. So although the only markets to score 800Nm and rear-drive are South Africa and Australia (or Straya, given our cultural disposition for burning rubber), it also results in a slower 4.1-second 0-100km/h claim. Our Straya E63 S AMG gets launch control, too, and weighs 56kg less than the RS6 Avant, at 1879kg, but that traction disadvantage is extended further by Contis that surprisingly can’t match the Audi’s Dunlops for grip. A 4.6-second 0-100km/h claim for the XFR-S seems almost slow in this company, despite standard 20s and launch control. Blame the 1987kg kerb weight, probably, a stat that gives clue to the fact this Jaguar’s platform dates way back to the 1999 S-Type. Out in storming straight-road country NSW, the seat-in-the-pants acceleration order closely follows that of the 0-100km/h claims. The way the RS6 Avant hooks up off the line is staggering, the pace of the eight-speed through the gears relentless, and the sheer thrust of the 4.0-litre unmatched by the Mercedes-Benz until well beyond legal speed. By contrast, the E63 S AMG scrabbles for grip off the line, its stability control light strobing faster than beams at a Berlin nightclub. When the automatic grabs second gear it slews the car sideways again, almost telling the driver to lift the throttle before the elusive 100km/h has even been reached. Clearly, the Alcantara trimming on the steering wheel of the E63 S AMG is there purposefully, to absorb the sweat of the driver’s palms. But the Benz is the only car here that transcends mere acceleration. On a country road, you don’t accelerate in it, but rather deploy it. Another reason the Benz isn’t as good off the line as the Audi is because the transmission isn’t as slick. The seven-speed AMG gearbox is slower to upshift, and in manual mode the delay between a slap of the right magnesium steering wheel paddle and a higher gear feels, relative to the acceleration, like an eternity. The BMW M5 certainly does pace, but it does it quietly. There’s the expected guttural growl, with some exhaust bark, but it sounds manufactured, with piped-in bass. There isn’t the natural, live theatre of the E63 AMG, nor the same ruthless off-the-line charge as the RS6 Avant. It was left feeling anonymous, as though it had no defining feature that raised it above this lot. Even the Jaguar XFR-S has that, in the form of its brilliantly crisp throttle response from the only supercharged engine here. Compared with the XFR, the S gets a super-touchy throttle that can validate claims to the constabulary that ‘I only feathered the throttle off the line’. But it also makes connecting with the Jag tighter than a Mark Latham handshake. The M5 engine may not have a single defining feature, but the BMW does have the single biggest driving flaw of the group, and that’s its stability control calibration. Even in its relaxed M Dynamic Mode (MDM) setting, merely breathe on the throttle with a bit of steering lock on and power is cut, dramatically. Press a little bit harder on the throttle over a patchy surface, and the electronics cut in. The M5 might as well have 200Nm for all its computers allow to the rears. It’s more frustrating than peak hour on Sydney’s M5. The M5 steering, meanwhile, is disappointing by class standards and poor by BMW’s. There’s nothing wrong with the weighting, which moves progressively heavier through Comfort, Sport and Sport+ modes and is consistent in each of them, nor the sharpness of the rack itself. But tactility and feel are sorely lacking, the system allowing many degrees of mid-corner steering change with what seems to be no corresponding front tyre movement. With these lows, however, also comes stratospheric highs. Switch all the stability control systems off and properly commit to hard driving, and the M5 steps up, proving dynamically stunning. As with the regular 5 Series, the way the M5 tips its nose into corners is unmatched. It has a real verve and lightness to it, and its sweet disposition is backed by sheer front-end grip and sublime rear-end balance. The active M rear differential – when released of the stability control’s strangle – does its best to make supplying 680Nm to the rear wheels at 1500rpm manageable. It isn’t intimate, the M5, but it is more progressive and fluid than two of the other contenders here. Unlike a standard 5 Series, the M5 also properly deals with country road undulations and pot holes at speed. Comfortable ride quality, even around town, and lazy torque may fool some into thinking today’s M5 should be badged 550i M Sport, but knowing what this BMW is capable of when the electronics are off means it not only deserves more than that, but deserves more than mere respect. BMW countered criticism that the current M5 had lost the edge and character of previous generations by saying the new car offers more things to more people, and that is true. But on the road, enthusiasts can’t access the dynamics when an inept stability control constantly intereferes. It’s not a problem for the others; so why is it for the M Division? The XFR-S sends the same torque as the M5 to the same-sized back wheels, but there’s an edginess to the Jaguar that makes the transition point between grip and slip difficult to judge. Blame the lack of a proper limited-slip differential, only an electronic system that brakes an individual rear wheel. The XFR-S sometimes lets an inside wheel flare out and sometimes it keeps it in check; it’s a problem we’ve encountered before with an XFR and it clearly hasn’t been fixed. Ironic, then, that the Dynamic mode – signalled by a chequered flag graphic on the centre screen – for the stability control is so much more finely calibrated than the BMW’s, allowing the Jag to keep itself ahead in really curly bends. Curiously, too, the Jaguar is the only other car here to feel genuinely light on its feet in corners, despite being the heaviest of the group. The nose of the XFR-S is its best asset, friskily following the orders of the sharp, light and consistent steering and allowing the driver to smoothly feed in throttle increasingly earlier as trust is gained. Don’t be greedy with that right throttle and the Jaguar XFR-S offers one of the most fluid driving experiences here. The suspension sits flat in smooth corners as well as absorbing big hits on a country road at speed. Its achilles heel is the worst around-town and freeway ride quality of the quartet; not harsh, but jiggly on ostensibly smooth surfaces and too taut over larger imperfections. We miss the ride of the standard XFR. Even in the tightest of the three adaptive suspension modes available, the E63 AMG rolls more than the XFR-S. Braking hard into a corner it suffers more noticeable dive than any other car here, and has the most blunt front end. But the AMG is the polar opposite to the BMW – it is immersive, communicative. Its steering is the best here, with lovely slickness, progressiveness on-centre, yet sharpness as lock is wound on. The throttle response is almost Jag-immediate and the ESC Sport superbly judged. You drive the E63 S from its rear, as it should be in an AMG. Despite all that grunt that excites the 19-inch tyres off the line, it communicates its slip point as though the satellite navigation lady just whispered in your ear. The masterstroke of the E63 S AMG is spring-front, Airmatic-rear suspension that in regular mode offers truly plush ride quality. Over one 70km/h urban arterial, the AMG loped effortlessly over chopped-up sections of concrete and skimmed over the ripples and joins. There’s slight floatiness over undulations, but it’s preferable to the harder two suspension settings that make progress more Jag-jiggly. Save them for smooth roads and race tracks. It would be difficult to see how the ride quality status quo could be changed when the E63 AMG sets such a high bar, but it is, and by a manufacturer not exactly renowned for producing smooth-riding cars. Simply, the Audi RS6 Avant has an unbelievably good ride, and not just for a car rolling on 21s. It picks up more tiny bumps than the E63 S AMG, but only slightly. It is also fractionally more taut, eliminating all sense of float compared with the Benz. Arguably, it offers the better balance of comfort and control, and indeed the best here, though our test car came with steel springs and three-way adaptive shock absorbers which replace the standard air suspension as part of a $4900 option pack. The same balancing act is true for its dynamics. Audi launched the RS6 Avant locally on dead straight roads in the Northern Territory, where we praised its comfort and stability and awarded it four stars, but longed for twisty roads. Well, we found them, and the Audi RS6 Avant can comfortably add another star to its overall score. This is a staggering car dynamically, truly one of quattro Gmbh’s finest-ever efforts. Those bulged-out front guards are there for good reason. The front tyres still stick out of them, so wide is the front track (1662mm); 32mm wider than a regular A6, 64mm wider than the Benz, 103mm wider than the Jag, but 5mm narrower than the BMW. The Audi doesn’t feel light on its feet, or as frisky at the front end as the BMW and Jaguar, but it nails them for cornering speed. Yet that doesn’t make it an inert, point-and-shoot car. So fast can the RS6 Avant be rushed into corners that it’s possible with trail braking to unglue the 21-inch rears and get it to slide slightly. In tighter corners it’s possible to steer the Audi from its rear, too (60 per cent of drive goes to the back wheels normally, and up to 85 per cent at times, meaning between 420-595Nm to the back wheels). The steering is fast, incisive and connected, the stability control almost perfectly tuned. Even with the extras fitted to our test RS6 Avant, plus the assistance package required to near-match the E63 S AMG for safety technology, the Audi still comes in at $248,775, or $1125 cheaper than the Mercedes-Benz. It is the better car, too, although the fight between the E63 S AMG and M5 is much closer. The second place decision comes down to a choice between consistent excellence, or higher handling achievements but with two sizeable blips. Talented steerers will take the BMW every time, even for sheer involvement and outright dynamics over the Audi, but its unexciting engine and disappointing steering and stability control hands it the bronze overall. 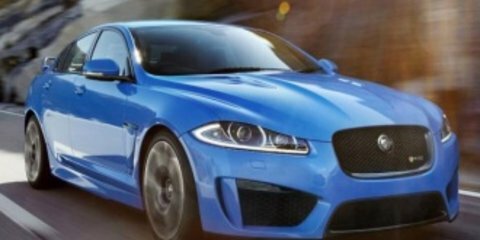 The Jaguar XFR-S, meanwhile, has plenty of British swagger and charm, but without a limited-slip differential, nice ride quality, and safety technology, its brilliant engine, steering and dynamics are a bit betrayed. But what a bargain the regular XFR is these days at $190K – it would be our pick over the XFR-S. Unlike its trio of rivals, the Audi RS6 Avant is a near-faultless car for the money, mixing benchmark practicality, interior quality and, arguably, styling, with a level of performance, ride, steering and handling that presents the finest balance here. It is the surprise winner, and a stunning effort.